Are you ready for IsaU Auckland? The only IsaU hosted in New Zealand for 2017, tickets are selling fast and it’s no surprise why. With two days of inspiring success stories and premium training from Top Leaders, you don’t want to miss this – it’s going to be sweet as bro! Our jam-packed agenda will have you leaving the event fully equipped, bursting with belief and ready to take your Isagenix business to the next level. 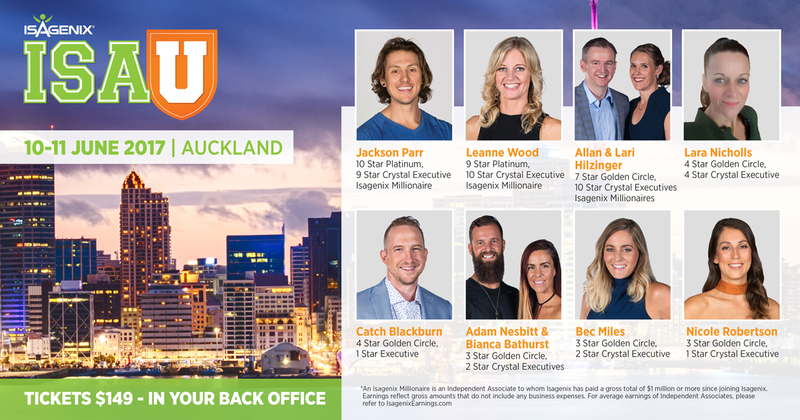 IsaU Auckland is your chance to receive exclusive training on how to grow your Isagenix business. Gather your fellow team members to attend together or bring someone new to experience the excitement and culture that surrounds Isagenix. With such an incredible lineup of speakers, you’ll definitely work up an appetite. Embrace the Isagenix products and get a boost of energy at the Singles Bar! With a wide range of delicious, individual items available for purchase, you’ll be revived and ready to power through the weekend. Ready to transform your life? Why not stop by the IsaBody Challenge® stand and visit our 2016 IsaBody Challenge Grand Prize Winner, Sarah McMinn. Hear how she smashed her challenge and took home the pirze and then register yourself and your team for the Challenge! If you’re eager to take your business to new heights, this is the event for you. Tickets are available to purchase through your Back Office but get in quick before they’re all gone! Looking for accommodation in Auckland? You’re in luck! Book through Ozzacom to take advantage of exclusive deals for IsaU Auckland attendees only. Keen to volunteer? Join our Green Army! Have you volunteered at an Isagenix corporate event before? If you have, you’ll know how much fun they are – an opportunity to plug in, connect, get a back-stage look and receive a range of Isagenix goodies – If you haven’t, we’d love to have you and if you have well then you know you’re keen to experience all the fun, laughter and learning again! Visit the Volunteer tab on Isagenix ANZ events website to complete a short form to apply for a volunteering position. *Isagenix Millionaires are defined as Isagenix Associates who have cumulatively earned $1 million or more with Isagenix. Earning levels for Isagenix Independent Associates that appear in this publication are examples and should not be construed as typical or average. Income level achievements are dependent upon the individual Associate’s business skills, personal ambition, time, commitment, activity, and demographic factors. For average earnings, see the Isagenix Independent Associate Earnings Statement found at IsagenixEarnings.com. What to Look Forward to at ANZ Celebration 2019!